Nowadays, buzzwords like sustainability and eco-friendly are a common occurrence in conversation, even more so now with Earth Day this month. Step back about 20 years and these “green movement” words were still fresh in our minds, yet some people at the Wisconsin Union were beginning to explore more sustainable ways of operating. “We needed to put our money where our mouth was in terms of sustainability,” said Darren DeMatoff. 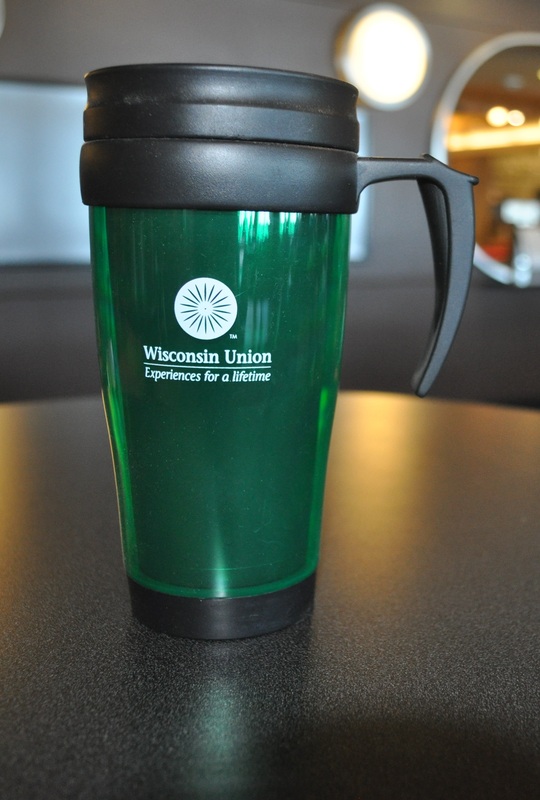 A student at the time, Darren helped push an idea that you could literally put your mouth on—the Union’s reusable mug program. The idea was sparked through a student organization’s fundraiser in 1985. 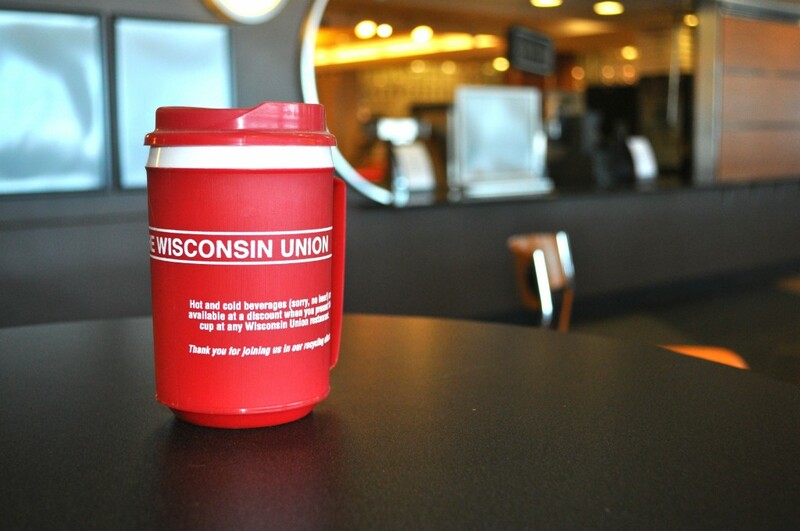 The student organization collaborated with the Union to sell mugs that provided mug owners with discounts on drinks and at the same time helped the Union reduce the number of disposable coffee cups that were going into the trash. Past and present collide. The current reusable mug, pictured left, stands next to its original ancestor. Darren was a member of the Wisconsin Union Directorate and also worked in Union dining services. His involvement allowed him to talk up the idea with every guest that would listen. “I was probably annoying, but talking a lot about the idea helped make it happen,” Darren laughed. 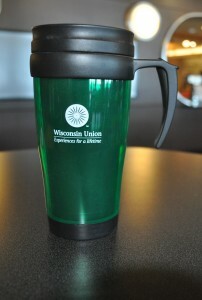 The reusable mug’s popularity grew just like the sustainable efforts in the Union over time. “The mug program foreshadowed future sustainable endeavors to come to campus,” said Assistant Director for Dining Services Carl Korz. Nowadays, You don’t have to look far to see recycling and compost bins, local food options and biodegradable products used in the Union’s buildings today. The Union made sure the push for sustainability would be significantly successful by even allowing drink discounts on non-Union mugs. The only trouble the program faced was when customers started bringing in very large drink containers, so the limit of 21 oz was set for mugs applicable for the discount. With so many years of “recycling efforts” since the inception of the mug program, you’re probably thinking there are plenty of different versions of Union mugs floating around. 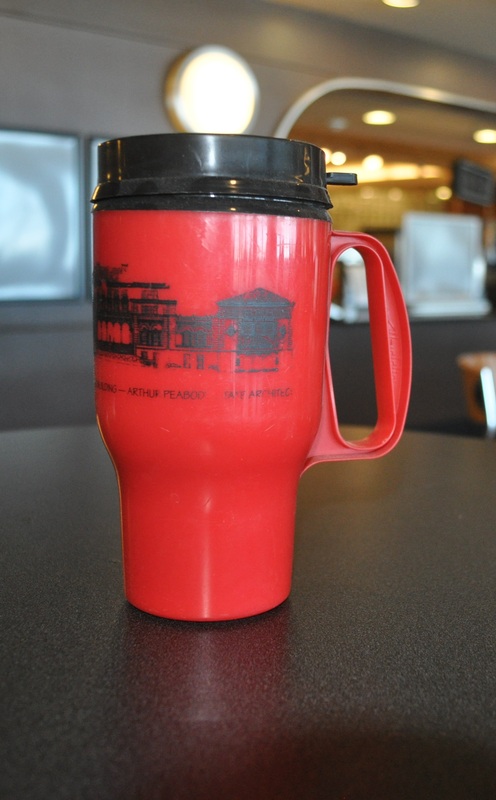 It took some digging, but we were able to hunt down the original reusable mug, owned by our very own Verne Scholl, Union Markets and Cafes division manager. Lucky for us, we hit the jackpot after finding out that Verne owns the only known collection of every single Wisconsin Union reusable mug since the program started. 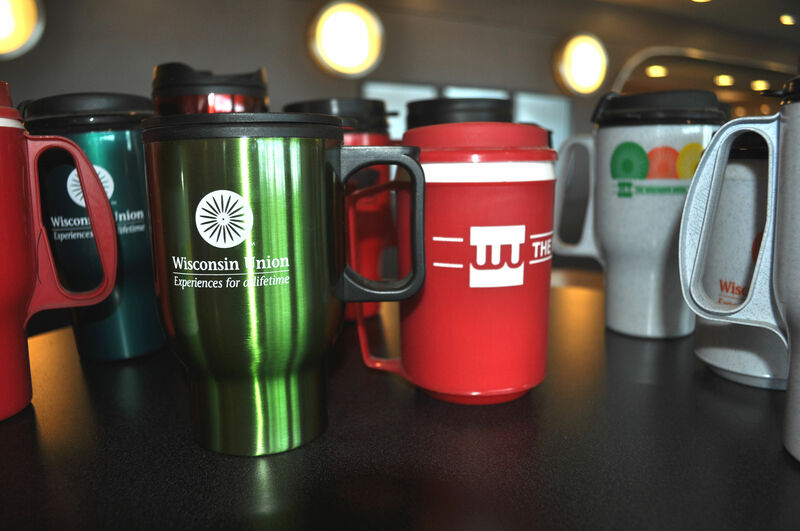 Featured in shades of red, green and grey, the mugs come in a variety of shapes and sizes, with different lids and variations of the Union designs. Besides one or two however, all the mugs share a common feature in their close-looped handles. 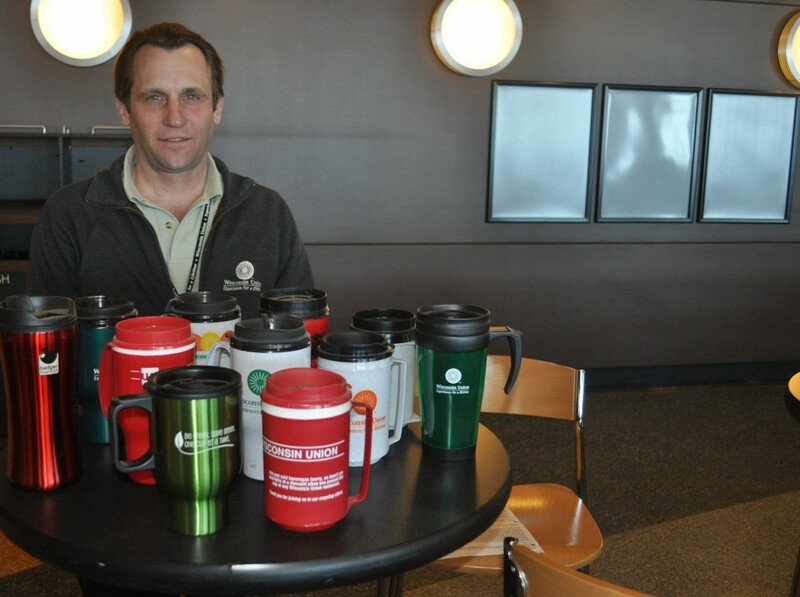 Verne Scholl with his collection of all the reusable mugs. “Students used to hang the mugs off of their backpacks,” Verne said. Motioning to a particular green mug, one of the select few with an unclosed handle, Verne goes on to explain how after that particular mug came out, he pushed for the closed handles again, for the ability to hook onto bags without falling off. Verne, like Darren, agrees the mug program was a great stepping stone in terms of becoming environmentally conscious here at the Union. “Currently, we’re pushing to have all Union restaurants composting their coffee grounds,” Verne said. 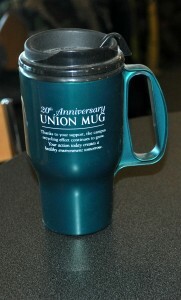 Do you own any of the Union’s reusable mugs? Share your thoughts on your favorite mug in the comments section below! For more information on the mug program, click here.